A look back at MEAA’s highlights from the past 12 months. MEAA members out in force working at the Australian Open, but there concerns over heat exhaustion. Under the Hands Off Our ABC banner, MEAA and CPSU launch an email your MP action for increased funding for the national broadcaster. MEAA takes the Sydney Theatre Company to the Fair Work Commission over concerns about workplace safety after a spate of attacks on staff. 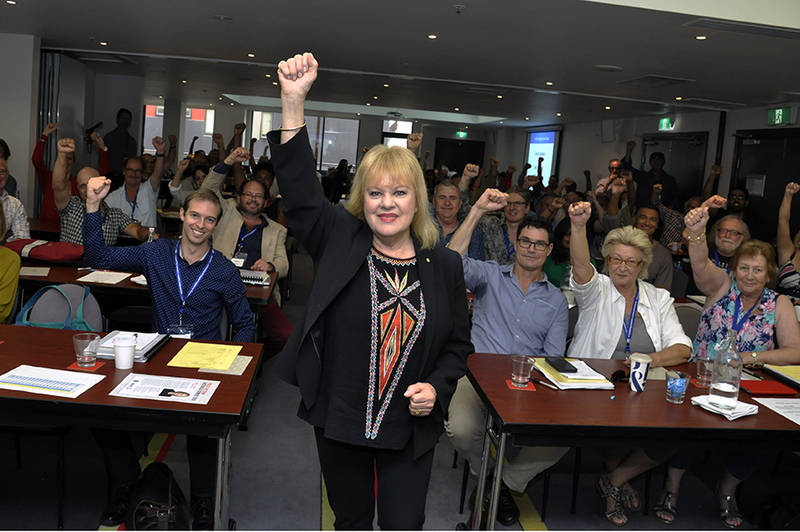 Federal Council meets in Sydney on February 25 and 26, and endorses a new three-year strategic plan for the union; former president Patricia Amphlett is made an life member. MEAA members Elka Wardega (best makeup) and Ben Osmo (best sound) win Oscars for their work on Mad Max: Fury Road. Patricia Amphlett was made a life member of MEAA at the federal council in February. Mates Over Merit report commissioned by Women In Media lifts the lid on the gender pay gap and sexist culture in Australia’s newsrooms. Equity reaches agreement with Screen Producers Australia over a new Australian Television Repeats and Residuals Agreement that includes digital rights for the first time. Journalists at The Sydney Morning Herald, The Australian Financial Review and The Age walk off the job on March 17 after the company announces redundancies of 120; more than 10,000 people sign a petition in support within 48 hours. Employees of the Australian Institute of Music receive more than $40,000 in back pay after MEAA takes action on their behalf. Beginning of a month of action on press freedom under the handle of #vote4pressfreedom. MEAA launches new guidelines for ethical media internships. Creation of new Australian Hockey Players’ Association within the ECS section. 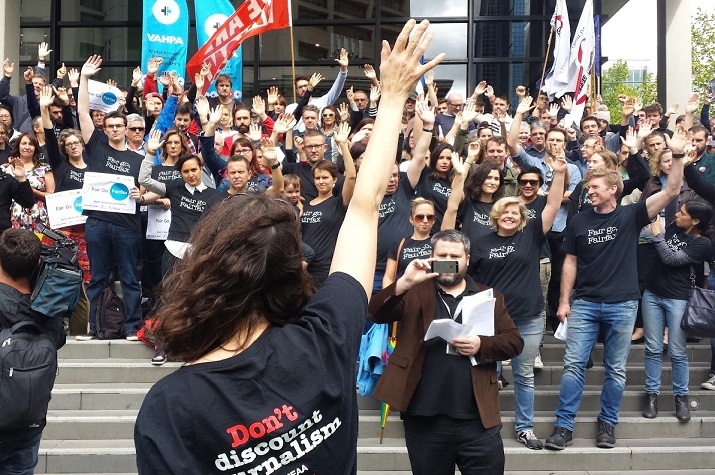 Journalists at Fairfax Media’s daily papers in Sydney, Melbourne and Canberra took industrial action in March. Throughout the month, MEAA visits 22 screen productions around the country, collects 469 individual selfies and signs up 52 new crew members as part of the Get Real On Rates campaign. Women In Media holds Victorian launch at £100 Bend in Melbourne. The cast members ABC comedy Utopia, SBS drama The Principal and Seven miniseries Peter Allen: Not the Boy Next Door win the 6th Annual Equity Ensemble Awards . Release of 2016 press freedom report, Criminalising the Truth, Suppressing the Right to Know. Online survey gets underway to gather evidence for major case to update the Journalists’ Published Media Award for digital publications. Meetings held in the state capitals of performers to discuss growing concerns about foreign artists being imported to work in Australian musical theatre. MEAA writes to main political parties to request legislative changes to better protect journalists’ sources and whistleblowers. Voting opens for endorsement of the new ATRRA by Equity members. Turnbull Government re-elected. In a pre-election scorecard of the major parties, MEAA was critical of the Coalition’s failure to produce an arts policy to take to voters. The ATRRA agreement is overwhelmingly endorsed by 98.5% of Equity members who voted. Murray Smith, a former sub-editor at Melbourne’s Leader newspapers and stalwart of MEAA’s Media section for more than half a century, passes away aged 75. The Equity Wellness Committee held Wellness Morning Teas around the country on October 12. 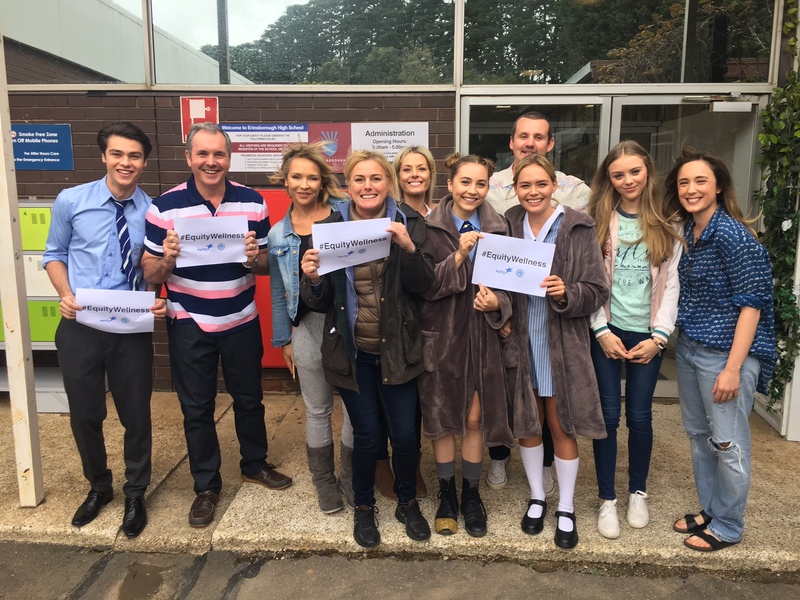 Here, the cast of Neighbours join in. 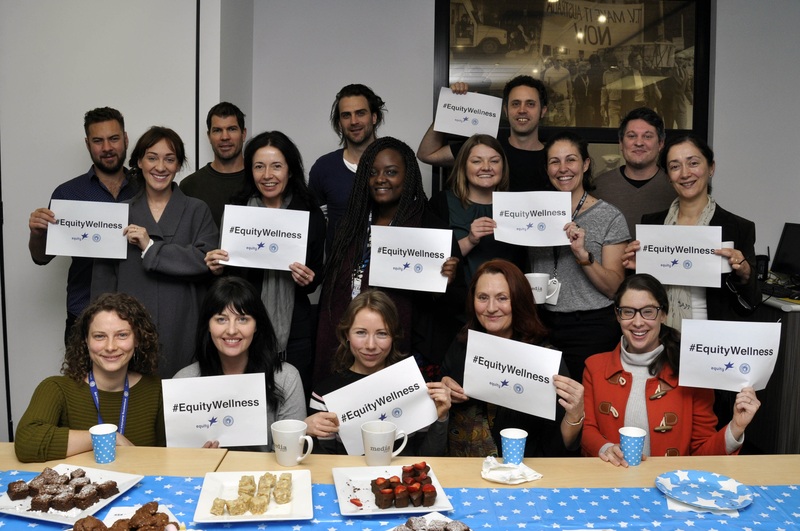 The newly-formed Equity Wellness Committee, chaired by performer Liam McIlwain, holds its first meeting and sets out an ambitious agenda to put physical and mental wellbeing at the forefront of all Equity activities. Four journalists from East Timor are announced as the inaugural recipients of the Balibo Five-Roger East Fellowship, an initiative of MEAA and Union Aid Abroad-APHEDA. MEAA raises significant concerns about the impact a proposed merger of Perth’s Sunday Times and West Australian newspapers would have on media competition and diversity in WA. The Fair Work Ombudsman decides to take no action following an investigation into the industrial action by Fairfax Media employees in March. 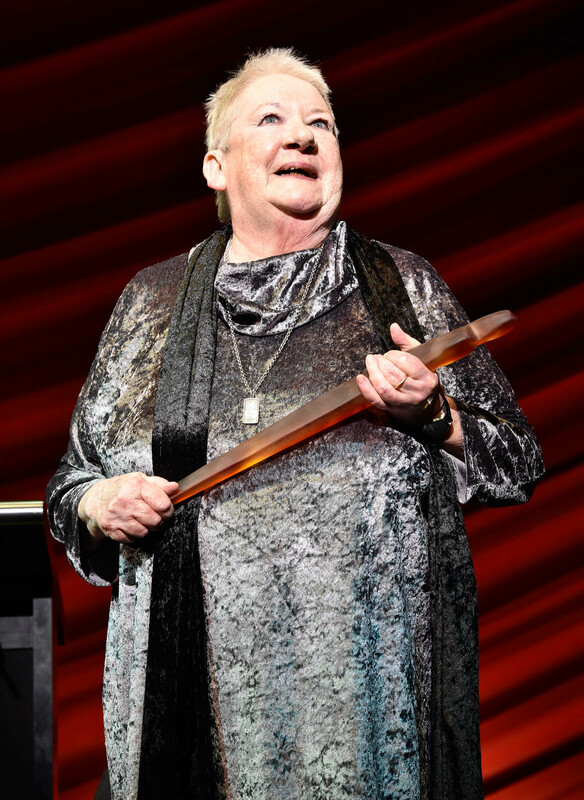 Elizabeth McRae is announced as recipient of the NZ Equity Lifetime Achievement Award. A Tongan charity that helps young people find work is the recipient of 15 computers donated by MEAA. MEAA members play a leading role in a gender equality forum convened by the Victorian Government to help inform a new gender equality strategy. Freelance photographers are allowed to continue working on Victorian race tracks following intervention by MEAA to overturn a Racing Victoria directive. MEAA members at the Sydney Opera House vote for a new enterprise bargaining agreement which secures pay rises of 2.5% and protection of their working conditions. Pearl Tan, a co-founder of the Equity diversity committee, is named one of the Australian Financial Review/Westpac’s 100 Women of Influence for 2016. Twelve months since the commencement of Australia’s metadata retention regime, MEAA expresses ongoing concern that the powers granted to government agencies to secretly investigate and monitor journalists’ metadata to identify sources is a serious threat to press freedom. Equity and Screen Producers Australia release a draft child safety code of conduct for children working on film and television. MEAA warns that the next wave of Australian acting talent will be put at risk by a federal government decision to axe hundreds of vocational education and training courses. 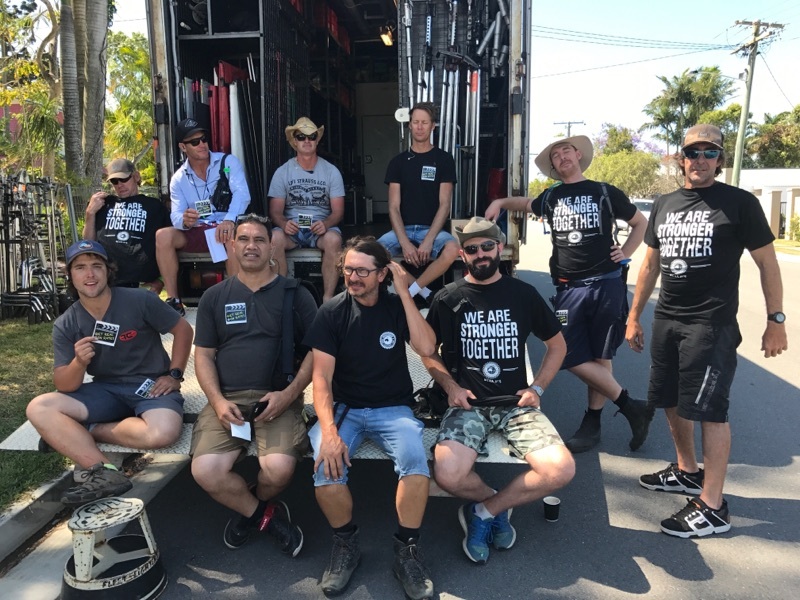 On October 26, screen crew members around Australia take part in a national day of action for the Get Real on Rates campaign for an industry agreement that keeps pace with cost of living changes. Crew members held a national day of action for the Get Real On Rates campaign on October 26. MEAA seeks confirmation from News Corp Australia that there will be no forced editorial redundancies to achieve $40 million in cost savings in the current financial year. Journalists at The Age form a guard of honour for 22 colleagues finishing work on November 11 after redundancies at Fairfax’s Weekly Review group of suburban newspapers. MEAA members call on ABC managing director Michelle Guthrie to outline her strategy for the broadcaster following more budget cuts, job losses and major programming changes at ABC Radio National. Equity and theatrical producer Michael Cassel Group agree to new guidelines for the engagement of overseas performers on Australian stages, paving the way for an industry-wide approach. The second Equity Summit, called ‘Gender on the Agenda’ is held over two days in Melbourne. Speakers include Madeline Di Nonno of the Geena Davis Institute in Los Angeles, director Gillian Armstrong, and ABC managing director Michelle Guthrie. Four MEAA crew members were among the winners of the 6th Annual Australian Cinema and Television Arts Awards held in Sydney this week. The Fair Work Commission begins hearing an application by MEAA to vary the two key Awards for journalists so that paid overtime becomes the default option rather than time off in lieu. 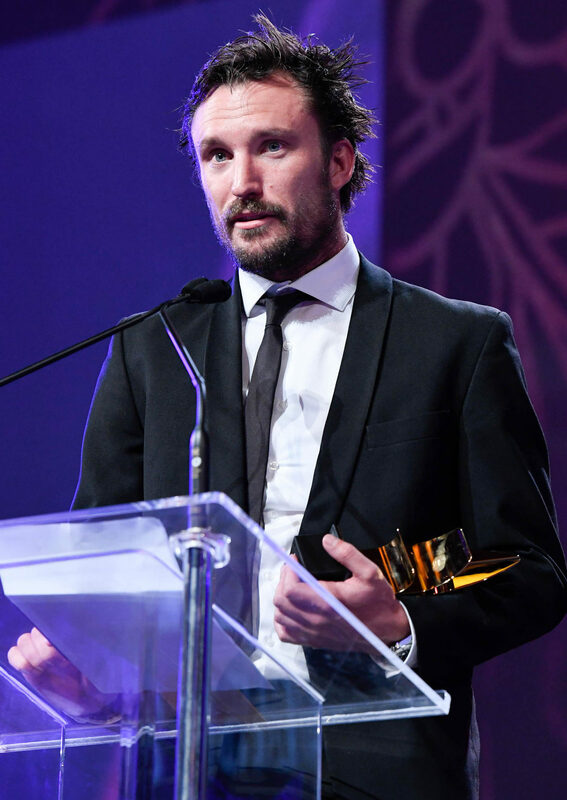 Award winners: Anne Phelan accepts the Equity Lifetime Achievement Award; Andrew Quilty with his Gold Walkley Award.